This predaceous insect was found on spring growth of globe mallow. Mesa, Maricopa Co., Arizona. 9 April 2016. Photo by Allan Ostling. 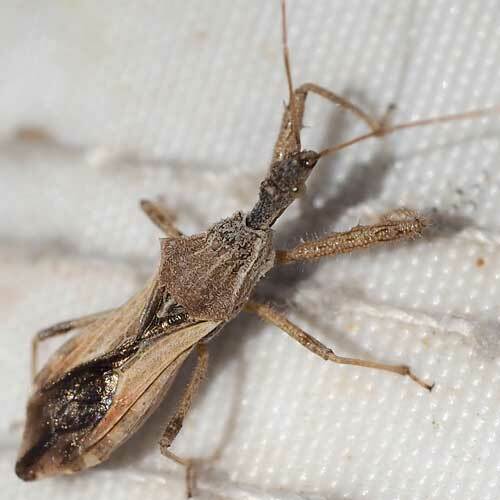 Zelus bugs use an interesting technique for capturing prey: the tibiae on the first pair of legs are coated with sticky glue which helps hold prey while the sharp beak penetrates and delivers salivary poison. Z. tetracanthus has two spurs on the corners and two more on the dorsum of the thorax. Base color is often ashy gray. Copyright Michael J. Plagens, page created 8 Nov. 2016.